The hair! The clothes! The supply-side economics! 3. 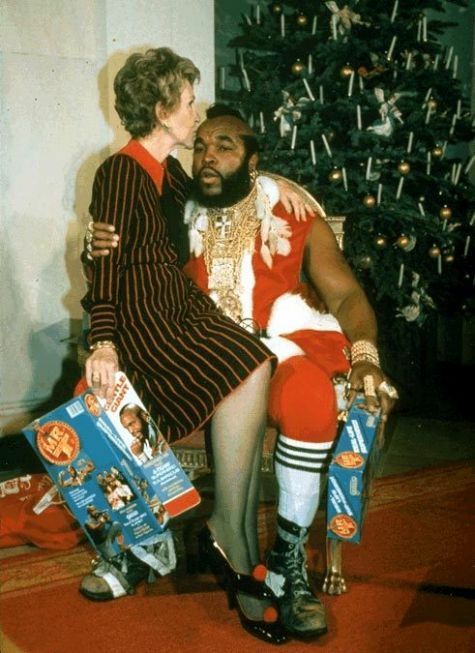 Nancy Reagan sitting on Mr. T's lap. 4. Ronald Reagan telling Frank Sinatra to stop dancing with his wife. 5. Bob Hope at a dinner for British Prime Minister Magaret Thatcher. 6. Nancy Reagan shaking hands with Meryl Streep. 7. Audrey Hepburn and Robert Wolders at a private dinner for the Prince of Wales. 8. Ronald Reagan with Arnold Schwarzenegger at the Republican National Convention. 9. Nancy Reagan talking with Warren Beatty and Diane Keaton at a movie screening for "Reds." 10. Ronald and Nancy Reagan receiving a baseball from Frank Sinatra. 12. Tom Selleck, Dudley Moore, and Lucille Ball at Bob Hope's 80th birthday party. 14. Charlton Heston at a meeting with the Presidential Task Force on the Arts and Humanities. 15. Steven Spielberg after a screening of the movie "'ET." 16. Christie Brinkley, Cheryl Tiegs, and Brooke Shields at a Tribute to Bob Hope's 80th birthday party. 17. 1981 Miss Universe Shawn Weatherly and 1981 Miss USA Kim Seel Brede in the Oval Office. 18. Ella Fitzgerald after her performance for King Juan Carlos I of Spain. 26. Clint Eastwood and Louis Gossett Jr.
27. Nancy Reagan talking to Elizabeth Taylor. 29. Princess Diana dancing with John Travolta in the entrance hall at the White House.